Showmen riding cinema lorries have brought the wonder of the movies to faraway villages in India once every year. Seven decades on, as their cinema projectors crumble and film reels become scarce, their patrons are lured by slick digital technology. A benevolent showman, a shrewd exhibitor and a maverick projector mechanic bear a beautiful burden - to keep the last traveling cinemas of the world running. Award winning photographer Amit Madheshiya’s 2010 work of India’s cinema travellers sparked off the idea for this documentary. Together with filmmaker Shirley Abraham they formed Cave Pictures in 2015. 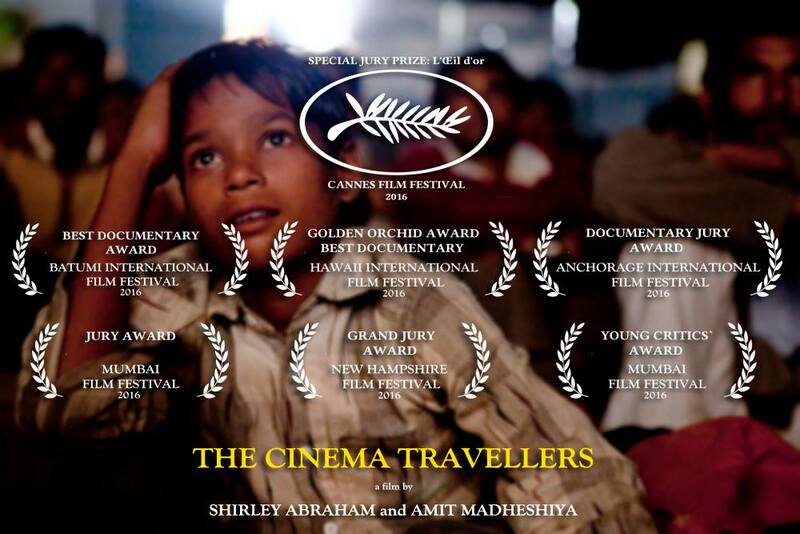 “The Cinema Travellers” is their debut feature and has since garnered international accolades, including Cannes 2016 Golden Eye Special Mention and many others listed below. Made over 5 years, this fascinating documentary follows the Akshay travelling cinema company as it makes its stops. The film offers us a glimpse into how audiences in another part of the world embrace movie magic. No popcorn or comfy seating, high octane entertainment nonetheless as throngs of viewers young and old are enthralled by romances, mysteries, and musicals projected on the big screen. The documentary is an homage to the celluloid and how the antiquity of the old movie projector – that hulk of a machinery that takes up almost a third of a room and which needs oil to run – still a functional piece of equipment, the remains of a potent Lumière lineage. Well, functional to the point when it breaks down during a show, and that is a frequent happening. We are also introduced to Prakash, a technical genius who for decades had opened his shop to repair these antique cinema projector machines. A genuine machine whisperer, Prakash had invented a film rewinder for the big reels. Half way into the documentary we see a turn into a new era as the Akshay staff are introduced to the digital projector. There is another set of technical difficulties to work with now and that involves the use of a computer! Shirley & Amit's labour of love, that captures the annual phenomenon of travelling cinemas in rural India, went through an eight-year-long research and filming process and fortunately it was worth the eﬀort. BBC Talking Movies- Profile Cinema Travellers from IndieMeme on Vimeo. The 2nd Indie Meme Film Festival, showcasing the best in South Asian Cinema, starts this Thursday at the Arbor. They are showing what might just be my favorite doc of the year, THE CINEMATRAVELLERS, and I want to give it my tip-top recommendation. The filmmakers follow a roving company of movie exhibitors who drive from town to town in a 70 year old truck that is outfitted with a 35mm film projector. They show films at religious festivals, market fairs, etc. We see their behind-the-scenes triumphs and failures as they traverse a rural India that we rarely glimpse. Along the way we meet the ancient man who maintains the projectors. He takes us into his workshop and tells us his philosophy about the magic of 35mm. We also inevitably confront the digital age as the company's impresario is forced to face the fact that his audiences want current stars in current films, which are digital only. There have been very dry films made about the transition of film exhibition from a primarily 35mm based exercise to a digital one. Those films lack the poetry that is needed to convey the essential appeal and perfection of 35mm film exhibition. This film makes a much more profound statement on that theme than I would have thought possible. It's a revelation. THE CINEMA TRAVELLERS unfolds like a Wiseman doc, it has no narration or ponderous exposition. One of the images that will always stick with me from the film is perhaps relevant here: as the company drives into a new town they employ kids from the village to go from door to door announcing the film. The kids work for free passes to the films. One child receives the perilous assignment to climb a tree with a very loud bullhorn and announce "ATTENTION CINEMA LOVEEEEERS!!!!!" This movie really grabbed me. I hope it grabs you too.